Realize your inner Mae West. This weekend was a double whammy of shopping events with Artisanal LA and Unique LA and even though I was supposed to be shopping for others there, I couldn’t help but covet a bunch of stuff for myself. Here are just a few of my favorite discoveries. And even though you may have missed the sales, not to fret, you can still buy these goodies online at their respective vendors. Happy holiday shopping! Bedford Falls Headwear ($20-$70): When I saw all these lovely vintage-looking headbands with plumes and sparkle on display at the Unique LA booth, my inner Clara Bow squealed. So many beautiful handmade “fascinators” that I didn’t know which one to pick. Stuck between the choice of two — one dark red that would have been perfect for holiday parties and the other with a leather patch and a bit more showy tuft of feathers that would work well for a fancy night out at La Descarga — I just went with both which were about $15 each at the show. On the Web site, each fascinator is named after It girls from the past like Veronica Lake and Josephine Baker. 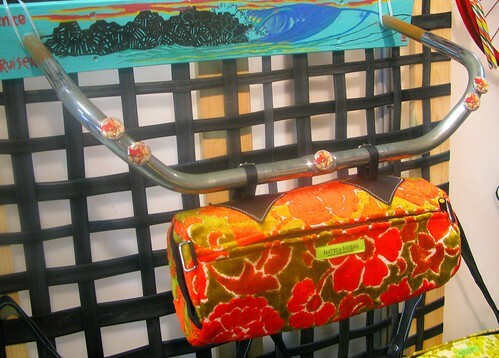 Beatrice Holiday Bike Handlebar Purse ($54-$84): A stylish alternative to the usual bike basket. Each handcrafted bag is made out of vintage fabrics and is equipped with a strap so it can transition from your bike to your shoulder. Not big enough to hold groceries but the perfect size for toting your cell phone, wallet, keys and sunglasses. Kauzbots ($24.99) are probably the only robots you can cuddle with. These stuffed toy robots are awfully cute and they even have a little heart in their back pocket that will most certainly belong to you. But the best part is that each robot represents a good cause, meaning that 10% of its proceeds go to a specific cause. There’s hot pink Kaprice for breast cancer, orange Karissa for world hunger/poverty and gray Kalvin for homelessness. Their available at stores like Fred Segal and Aahs but you can also purchase them on the Kauzbots Web site. Graze Organic Reusable Sandwich, Snack and Lunch Bags ($24-$38): What’s cool about these bags is that you can just throw them in your washing machine after each use. Perfect for your favorite environmentalist. The newly launched totes usually run $29.95 but were $28 at the holiday pop-up. Weekend Store Los Angeles Vintage Map ($28): Cute way to celebrate your favorite city. 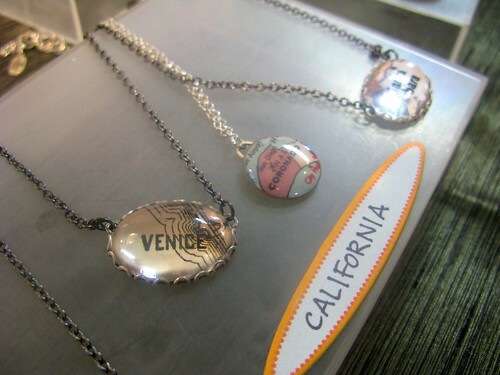 At the Unique LA booth, I didn’t see any L.A. necklaces, just this Venice one, but looks like you can order them online at the store’s site. Talking Carl T-shirt ($20): OMG, I LOVE the Talking Carl app on my iPhone. He’s so adorable and bratty, mimicking everything you say in that high-pitched voice. So I was elated when I came across this T-shirt at the Three Apparel booth. Three Apparel is a local t-shirt shop which features original artwork on its tees. Well, except for the Talking Carl one which TC’s maker, Yann Le Coroller, had asked Three Apparel to create a tee for. 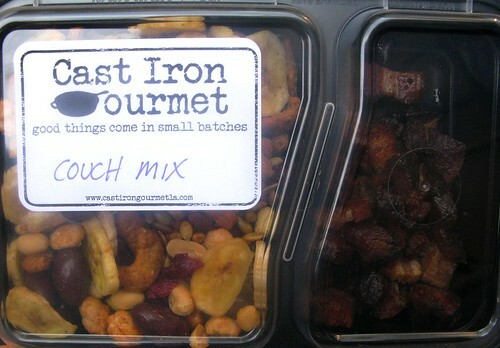 Cast Iron Gourmet’s Couch Mix ($11, 2 for $20) is the couch potato’s trail mix created by chef/owner of Cast Iron Gourmet, Rashida Purifoy. A brilliant amalgamation of caramelized bacon, dried fruit, chocolate and nuts, Rashida had originally created it for her crew of friends to munch on over Sunday afternoon football. At the moment, the mix isn’t available for purchase online, unfortunately. But Cast Iron Gourmet will do a pop-up at Eagle Rock Brewery January 1, where she said she’ll most definitely have some for sale. Or you can always make do with the tasty bourbon bacon chutney which is sooo delicious with the bacon mayo pimento cheese spread — both available online. YUM! Kim White Equestrian Belt in Pewter ($110): Dammit, I should have bought this when I saw it at Unique LA. There, it was $55, which I guess is the wholesale price. Argh! Made with leather with a metallic finish, it’s so unique and stylish. Sugarbird Sweets & Teas Gift Basket: Came across this adorable tea gift basket which contained sugar snowflakes, madeleines, tea and homemade marshmallows. The basket at the Artisanal LA booth was about $39 but you could put your own together via the Sugarbird Web site which even sells a wire basket ($5) so you could together your own. 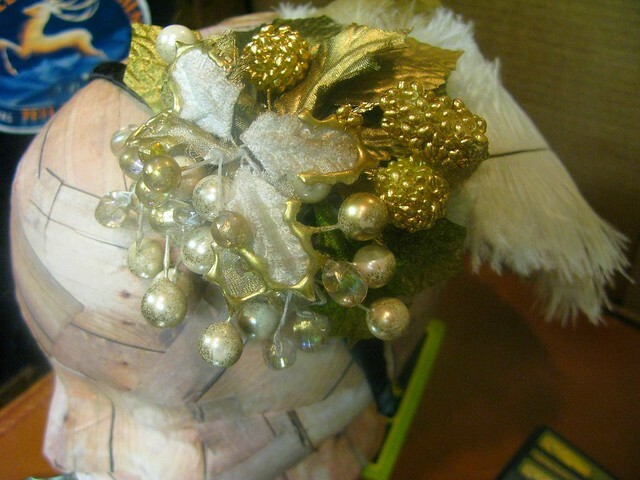 The Bedford Falls Headwear pieces were beautiful and the girls were very friendly. So many pieces looked great on my girlfriend that it was hard to choose just one (I got a lot of my Christmas shopping for her done at Unique LA. If I notice that there is something she really likes but probably wouldn’t buy it for herself, out comes my wallet and one Christmas present down). Aw, you’re a good boyfriend. Cool post. I attended both events yesterday. I was already a believer in Artisanal LA, and really liked the vibe of Unique. 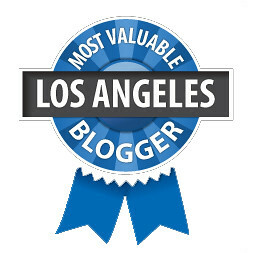 High energy, lots of unusual gifts and plenty of L.A. love. I bought some good Christmas gifts, but couldn’t justify buying the yellow BEER socks. They were really fun events. I wish I could have bought EVERYthing on my list. And you should have bought those socks! You could wear them at home while cracking open a growler. Great coverage; I missed these items! There was so much to see to buy to do!